Your website is public. But maybe you have a few pages that maybe shouldn’t be so public. Or maybe you have a membership site for people above a certain age. Or maybe you just have content you want people to know contains content that younger folks may not need to see. Whatever your reason, one of these WordPress age verification plugins is likely what you need to get the job done. You really can’t go wrong with a plugin titled Age Checker when you are looking to check someone’s age. A premium plugin that costs $27, Age Checker has what you need in an easy-to-use package that does exactly what it sets out to do. You get some gorgeous layouts and customizations to choose from, and you have nifty features like redirecting the people who don’t meet your requirements to a different page altogether. Responsive for mobile, and it gives instant previews of any changes that you make — so if you’re a Divi or page-builder user, you’ll feel right at home with this one. “What?” you ask. “A plugin called Popup Maker for age verification?” Why yes, actually. But with a catch. WP Popup Maker on its own can’t do this. It’s a free plugin that you can get off the WP.org repo. While it’s a very powerful plugin in its own right, the Popup Maker add-on for WordPress age verification modals is where it’s at. At $35 for a single site license, it’s perfectly affordable and can do whatever you need it to do because it’s built on an already fleshed out plugin. Plus, since it’s built on top of a pop-up making plugin, you get the added functionality of including any other pop-ups that you may want in one place. Much like Age Checker, Age Verifier really does one thing well. 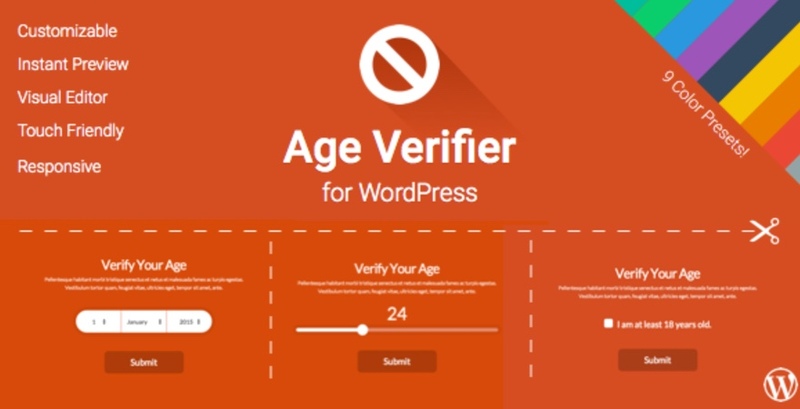 It lets you make simple and beautiful age-verification messages for your WordPress site. If you don’t want to just have people put in their birthdays, you can also just have a simple checkbox or a very delightful slider (I may be partial to sliders). But that’s just the beginning. You get customization options for everything you could want to customize, from animations to colors to how long the cookies it uses last for your users. The colors are bright and vibrant, guaranteeing that your visitors are not going to miss your asking them for their birthdays. This is a premium plugin, too, but since it comes in at once $18, it’s not going to break many budgets. If just regular old Age Verifier above wasn’t easy enough for you, let me introduce you to Easy Age Verifier, a free WordPress age verification plugin on the repo. What you may be interested in with this plugin is how smart it is regarding your visitors. If you have someone who has visited your site in the past, the plugin remembers their answer and doesn’t bother asking them to put in their birthday each and every time. Additionally, the developers have made the effort to keep Google’s crawlers whitelisted — because as smart as they are, they’re all fairly young because they are iterated on so often. Sorry, that was a bad joke. Regardless, it’s a free option, which is always nice to see. It’s quick and easy to set up, just like it says, and both of those together indicate that if you take a look here, you may not look elsewhere. Of all the plugin round-ups I’ve written, I think this one may be my favorite. Because as I wrote out my list and picked the top plugins out, I kept getting confused. Between Age Verifier, Easy Age Verifier, and on and on, it’s hard to keep them straight. But AgeVerify is a free plugin on the repo that you definitely want to give a second look, even if its name blends right in. The free version is ad-supported, but there is a Pro upgrade you can buy. 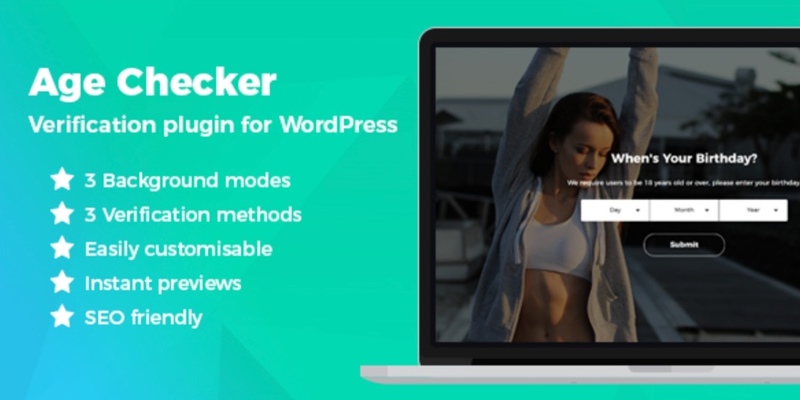 While AgeVerify doesn’t offer as much specific customization as some of the others, the developers included templates with some beautiful photography based on popular sites niches that may need a WordPress age verification plugin. It’s simple and pretty, so give the free version a shot. And if you like it, you can take the ads away for $59 a year. And the dev even do custom instances of the software for your particular brand. Now that’s service. I hesitated to include this one, but I thought it may actually help out. You see, this is a fantastic plugin that is no longer being developed. But the developer has indicated on the WP.org repo that he is looking for someone to take over. With open source software, that is just an invite for some fantastic experience and maybe a good GitHub fork. Not to mention how good the plugin is because of its unique take on the WordPress age verification game. You get full control of the plugin via CSS, and you can direct people to specific URLS, blanket protect post types, and customize the actual content warning that pops up. No matter which WordPress age verification plugin you choose, the job will get done. The warning for folks about the content will show and your pages will be protect. You can rest easy that plugin authors aren’t blocking bots, only children. Your SEO is safe, and so are they. If you want to go the free route, there are some fantastic options to get the job done. And if you have a budget and look to get more robust features and customization options, you can’t go wrong with any of the premium plugins on this list. What WordPress age verification plugins have you used in the past and what kind of content have you restricted? Excellent! BJ … You read my thoughts, I’m just developing a liquor website, thank you very much.